It’s Father Dave, back from my Monday night run and watching a replay of the Olympic Games closing ceremony as I pen my Monday Missive to you. I must say that it is wonderful to see the way in which playing games together can help break down racial and cultural barriers. Winning medals can also be a source of hope and pride to countries who have not had much to celebrate of late. Mind you, I find the Australia obsession with winning gold simply distasteful, and I recognise too that major sporting events like these can easily be used by politicians as weapons of mass distraction – diverting our attention away from real evils that these same countries are committing. One only has to think of the way Hitler used the Berlin Olympics of 1936 to help legitimate his sinister rule to be reminded that the Olympics are by no means immune from this sort of manipulation. Having said that, I’ve enjoyed the little I’ve seen of these Olympics and I do believe that sport can play a very positive role in promoting justice and peace and enriching human life. 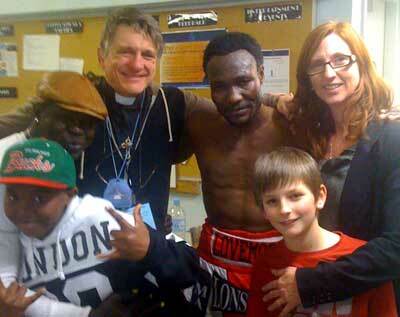 Our recent world title bout with our beloved parishioner, Lovemore N’dou, is a case in point of course, and I know you’ll be interested to hear the inside story. The result was never in doubt so far as we were concerned, but I can appreciate that Gary St Clair and his team didn’t share our perspective. Indeed, the newspaper report that day suggested that his group had placed a large wager on a St Clair win! We only found out after the fight that, while both Lovemore and Gairy St were technically retired, St Clair had apparently been in training to fight someone else when the opportunity to fight Lovemore presented itself. He was therefore in top condition! There was evidently something very personal at stake for St Clair in this fight. I don’t know the man well enough to hazard a guess as to what, but I certainly noticed that he seemed agitated at the weigh-in, not seeming to want to make eye-contact with Lovemore. I could appreciate that St Clair might be feeling nervous as he is a naturally smaller man than N’dou. He won his world title at Junior Lightweight, whereas Lovemore won his world title as a Light Welterweight! They were fighting at Welterweight, which means that they could weigh a maximum of 67kg, but St Clair had insisted that they meet at an agreed-upon weight of 64.5kg maximum. The surprise at the weigh-in was that Lovemore weighed in at 63.7kg and St Clair at 64.7kg! This meant that Lovemore was entitled to ask his opponent to don the plastic bag and do a few laps around the block to lose that extra 200 grams, but he was relaxed about it. St Claire’s agitation though was evident, and had only increased by the time the fighters reached centre-ring. He didn’t seem to want to touch gloves before the fight, and when the decision went against him at the end, he stormed off! And yet the verdict was never in doubt. Lovemore looked stronger from the opening bell, and while St Clair was brilliantly elusive throughout the fight, he never looked capable of hurting the black panther. I won’t say any more about the bout itself as you can watch it on the member site here. What I will say here is that this fight was more than just another boxing match. Indeed, it was the launch of a project that could affect the lives of a great many people. Lovemore’s plan is to use this attempt at a third world title to raise funds to support at-risk young people. Our Youth Centre has certainly been targeted as a key beneficiary though I know that Lovemore still has a heart for his homeland – South Africa – and is very keen to raise funds for young people who have been orphaned through the AIDS epidemic. These are early days, but my hope and prayer is that last Friday’s fight will lead to a series of colourful encounters that will allow Lovemore to fulfil his dream and make a real impact on the world – fighting poverty and disease and giving inspiration and hope to young people everywhere. I certainly intend to continue to work closely with Lovemore until that dream is fulfilled. 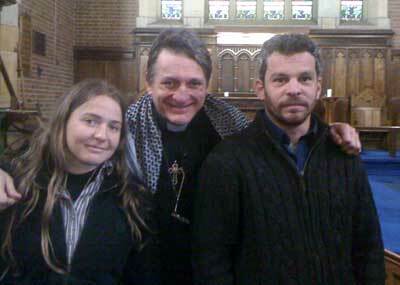 You will remember that the other big event we had planned last week was the visit of the two young Israeli human-rights activists – Sahar Vardi and Micha Kurz – to Holy Trinity. It was indeed a great privilege to be able to welcome these two lovely young people to our community. 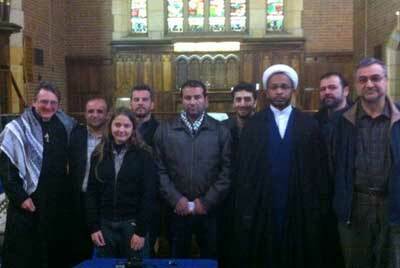 As expected, they were passionate and committed, and had each spent time in prison for the cause of justice and peace. Thankfully, the two were more than happy for me to record their addresses, and we’ve now uploaded each to the member site. You can hear Sahar’s address here. She spoke about growing up in Israel, about becoming aware of the injustices experienced by Palestinians, and about the price she is paying for taking a stand. And of course one of the wonderful bonus for us in having such wonderful guests is that the occasion brought together Christians, Muslims and Jews from across our region – united in a common concern for the welfare of our Palestinian sisters and brothers. OK Fighter, it’s nearing the magic hour of 3am and it’s time I wound this missive up! Let me say in closing that I am hoping this week coming to finally launch our live video-cast of the Sunday sermon here at Holy Trinity. I’ll confirm that though with you if it’s going ahead. In the meantime, remember that if you want to support our work, please consider joining us at the Fighting Fathers Member site. Your $10/month subscription keeps us online.